One of the pleasures of visiting the Amalfi Coast in the winter is the rare chance to visit some of the most beautiful spots without having to wonder how many tourist photograph albums you might have ended up in around the world. Sunny winter afternoons are one of my favorite times to stroll through Ravello and enjoy the views from the Villa Rufolo and the Villa Cimbrone. This coming summer when the gardens are in full bloom I promise I’ll take you all on a proper tour through the Villa Cimbrone. But in the meantime, grab your cameras, wrap a scarf around your neck, and let’s head down the Avenue of Immensity . . .
At the end of the long pathway is a beautiful building with a statue of Ceres, the Roman goddess of the harvest. At sunset the view is absolutely striking. Ceres watches over the steeply terraced land surrounding Ravello where grape vines and lemon groves bask in the warm sun. Just steps beyond Ceres is one of the most spectacular views you’ll find on the Amalfi Coast. This terrace is very appropriately named the Terrace of Infinity. And it really feels like you can see forever . . . Returning back in the gardens, you’ll soon find this charming Temple of Bacchus. While the gardens in January pale in comparison to their splendor during the spring and summer months, there were still a few bursts of color dotting the landscape. Little reminders that spring is coming soon to the Amalfi Coast! Not far from the Piazza Duomo in Ravello is the Church of San Francesco. Following the walkway that leads to the Villa Cimbrone you first see the campanile, or bell tower, of the church. Then you reach a beautiful atrium with the entrance to the church. I’ve walked through here many times, but the church has never been open to visit. Although Ravello was practically deserted this winter afternoon, we did find the church door open and ducked inside to take a look. It was a beautiful and very well-preserved interior. The church was empty, so we walked around for awhile looking at all the paintings and the architectural details. On either side of the apse above the altar there are beautiful paintings showing scenes from the life of San Francesco. Between these paintings there is a grate that likely served as a window for cloistered monks. I’m not sure about the story for these particular windows, but they were interesting to see. You never know when you’re traveling in Italy when you’ll stumble across an open door and find little treasures like this church. Continuing along toward the Villa Cimbrone, next to peaceful terraces of sleeping vines, we hardly met a soul while enjoying the quiet beauty of Ravello in the winter. I did say that we hardly met a soul. 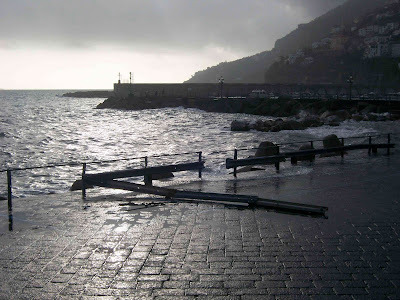 Today it’s raining again, but when the rain stops wintertime on the Amalfi Coast is truly magical! January in Paris is wonderful! We even had a light dusting of snow, which only added to the romance. I will share more stories here in the coming weeks. In the meantime, enjoy the slide show of photos from my trip above, and please do leave a comment with your favorite Paris memories. I would love to hear them! Last week we left the rain and clouds of the Amalfi Coast for a little vacation in Paris. (Pictures and stories coming soon!) While we were disappointed to return to still more rain Sunday evening, Monday morning greeted us with glorious sunshine. In Amalfi, the water shimmers in beautiful shades of sea green and bright turquoise during these cold and clear days of January and February. 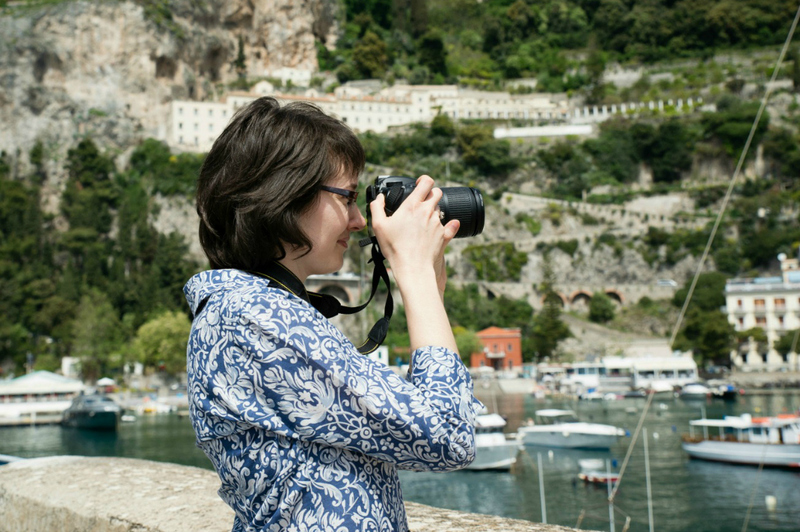 This is certainly one of the treats of being on the Amalfi Coast during the winter months! Today we’re enjoying another day of sun (I’m getting caught up on vacation laundry! ), and I’m ignoring the news that more rain is in store for us this week. Today it’s all sun! Can I Complain About the Rain? I know with all the terrible snow, flooding and bad storms around Europe and American these days that I don’t really have any right to complain about the near constant rain we’ve been having here on the Amalfi Coast. 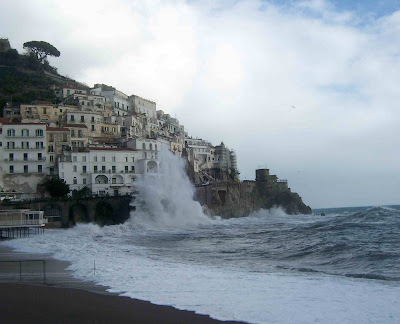 While winter weather on the Amalfi Coast can be a bit, well, glum, the winter storms do bring with them some rough seas that can be quite exciting. The shot above is looking toward the Hotel Luna in Amalfi. 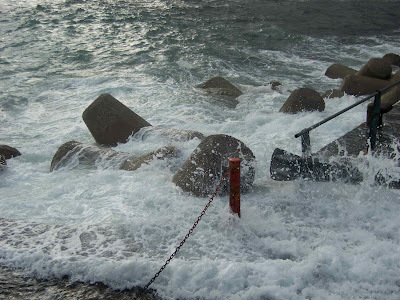 Let’s just hope no one was walking by when that wave crashed against the rocks! 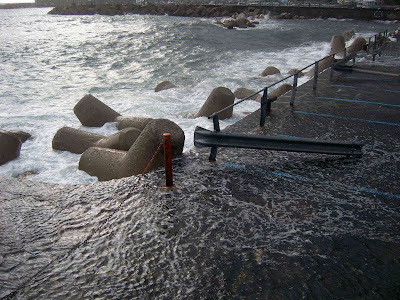 The power of the sea is always impressive to me. It is there so calm and clear some days, but in the back of my mind I remember just what it is capable of. Hope the weather for all you reading will improve soon!